Fans Can Star in the Video Alongside Weird Al Using JibJab’s ‘Starring You’ technology. The video, which just launched at JibJab.com and at weirdal.com, is a tongue-in-cheek homage to the iconic actor, comedian and game show panelist Charles Nelson Reilly. The song is an original composition by Weird Al produced in a hard rock style reminiscent of The White Stripes. A special version of the video using JibJab’s “Starring You” technology allows JibJab Members to cast themselves, friends and family into the video alongside Weird Al. It is the first time ever that a major recording artist has empowered fans to put themselves into a new music video. The “Starring You” version of the video is available exclusively at JibJab.com. 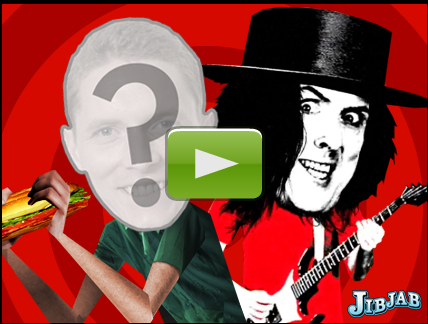 This is the second time JibJab and Yankovic have worked together. In 2006, the two produced a Taylor Hicks parody entitled “Do I Creep You Out” which can be found at JibJab.com/originals. About “Weird Al” Yankovic 3-time Grammy Award-winner “Weird Al” Yankovic is the biggest selling comedy recording artist in history. His last album, the Grammy-nominated “Straight Outta Lynwood,” (Volcano/Jive) debuted in the Top Ten on the Billboard chart. The lead single “White & Nerdy” went Platinum and spawned a music video that was #1 for 5 straight weeks on iTunes and VH1, and also became a viral Internet sensation, racking up over 100 million hits. For more information, please visit weirdal.com.